"Good low sugar recipe. Extra sugar is not necessary with the apple juice concentrate." In a sauce pan, combine the cranberries and apple juice. Cook over medium-low heat until berries burst. Additional sugar may be added if desired. Mix well, chill and serve. Very simple and great tasting. I added a little sugar though. Good but still a little tart, try adding between 1/4 and 1/2 cup sugar. 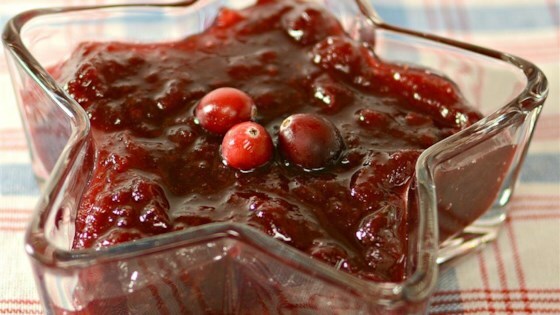 Still quite a lot less than most other cranberry sauce recipes and helps just a little in the tartness area. Although I wanted something low sugar and simple - I probably won't make it again. Easy to make. A little tart. This is the same recipe as Cranberry Apple Sauce I.